In 2002 Festalfine Ltd. (Festalfine), the Lichfield Court management company, identified a need for replacing the existing steel windows within Lichfield Court. Residents were finding that some of their windows no longer opened. There had also been many incidents where glass had simply fallen out and smashed on the private and public footways below. The existing windows formed part of the original construction and so had lasted nearly seventy years, but the need for replacement had now become inescapable. The condition survey carried out at this time confirmed this. There was also an urgent and unavoidable need to replace the electrical infrastructure so it was decided that these two projects should be carried out concurrently. In 2003 a further survey recommended that the existing windows should be replaced with aluminium windows. However, the application for permission to undertake this work, lodged with the local planning authority, was later withdrawn after the planners made it clear that aluminium would be unacceptable, in part due to the building being listed at the same time as the application was being processed. The listing of the building in 2004 led to the appointment of architects Hunter Price Chartered Architects to advise on window replacement. Discussions with the local authority conservation officer confirmed that aluminium was out of the question. Some leaseholders had previously replaced failing windows with PVCu alternatives but this material was also not permissible following the listing. After extensive research involving a number of competitive steel window companies, it was decided that the window replacement work should be handled by Crittall Windows Ltd who, in addition to supplying and fitting 36 different window types, would also provide doors and privacy screens (which divided the balcony areas between each flat). In all some 1500 separate items would be needed. Due to the 2004 listing of the buildings, Festalfine was faced with considerable conservation requirements to satisfy. It was also considered important to improve the thermal performance and acoustic protection of the current windows. Lichfield Court lies directly beneath the flightpath of Heathrow airport and so any reduction to the noise from the planes would be hugely beneficial. Festalfine, acting on behalf of all residents issued the following statement: "It is of paramount importance that the type of window used should be one which, while preserving the character and appearance of Lichfield Court, will also bring benefits of improved safety, more efficient thermal and acoustic insulation and lower long-term maintenance costs, all at the most competitive price." This statement encapsulates the requirements of the leaseholders of the 211 flats in Lichfield Court who would pay for the restoration and also the third party interests of the local authority Conservation Officer and English Heritage. A trial flat was fitted and improvements made to the safety and appearance, as a result of this, English Heritage withdrew its initial objection to double glazed units. Some leaseholders objected to the cost and the project was referred to the Leasehold Valuation Tribunal, which was at the time an independent body appointed to make decisions in disputes arising in leasehold properties. Some initial concerns were quickly satisfied and the LVT found the proposal the most efficient and cost effective way forward. Richmond Council granted final approval for the replacement of windows and the electrical work in December 2007 following recommendations from the council’s Conservation Officer and English Heritage. The total cost of the Electrical work and Window replacement work was £5.5m of which the cost of the 1500 windows, doors and privacy screens supplied by Crittall was £1.8m. The project was so well planned and managed by Festalfine and Hunter Price that the overall 8-month project was delivered on time and within budget. Rather than employ a main contractor a close-knit team of professionals including a Construction Manager directly employed by Festalfine controlled the project. Regular meetings between these professionals and the trades resolved issues quickly, and those involved say this had the effect of taking potential conflicts out of the system. The construction management approach proved flexible and led to a spirit of co-operation. 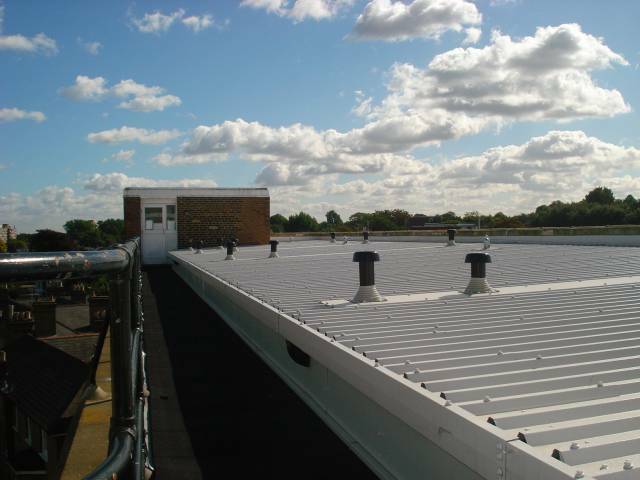 The absence of a main contractor with all the attendant overheads reduced the cost of the project by some £800,000. This directly benefited leaseholders, as Festalfine is a not-for-profit organisation. While all those involved in the running of the project agree that it was handled successfully, it is the judgement of the residents of Lichfield Court that provides the final verdict. Residents were given a date on which their windows would be replaced, six months ahead, which proved invaluable to those who had to make arrangements. They were also given a clear indication of how long different works would take to complete in the case of windows each flat should be finished within a day on average. The construction manager established a 'snagging and complaints' procedure at the outset, with the intention that any remedial work needed, was undertaken within 48 hours, whilst the scaffolding (a high cost element) was still in place. All the work was regularly monitored and Festalfine supplied leaseholders with regular bulletins on progress. As the work continued a steady stream of residents expressed their thanks to the management company for the way in which the work was carried out and for the finished result. The roofs of both the major and minor blocks at Lichfield Court had been leaking in various places for some years. 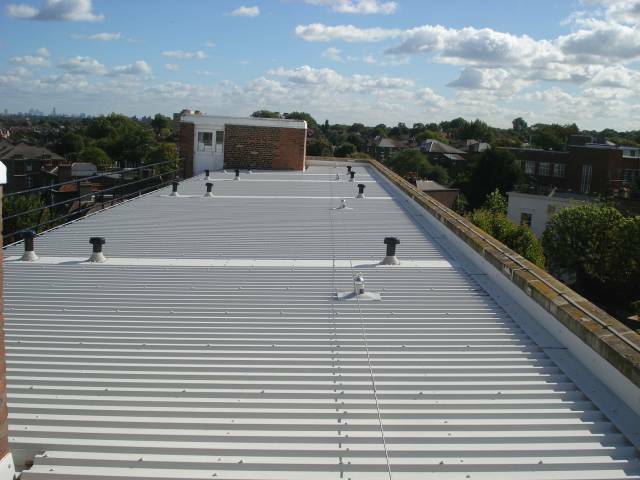 Minor repairs from time to time had only had limited effect, so in late 2009 the decision was made to change the structure of the roof covering to ensure it remained watertight for many years to come. The building movement over the years had destroyed the natural slope for water to run off resulting in serious ponding of water. This meant that the existing shingle needed to be removed and a new powder coated metal structure erected over the main areas. Condensation may have been a problem so vents were incorporated into the structure to ensure good air circulation. The railings and walkways were also upgraded to current standards and a Man-safe facility incorporated as a safety feature for any future work on the building. Many of the parapets had become unsafe and masonry had started to fall, so the opportunity was taken to replace much of the old crumbling brickwork. Festalfine once again entered into a construction management form of contract enabling Festalfine and its construction management team to operate tight control on methodology and costs. Despite bad weather, it is a great tribute to our construction team that the work was again completed on time and within budget. We should also pay tribute to the Festalfine staff who ensured that such a huge project was completed with a minimum of disruption and inconvenience. In 2014 work started to repair and repoint much of the brickwork on both blocks at Lichfield Court. The balcony parapets and the asphalt flooring of exposed balconies were in poor condition and needed to be repaired and re-asphalted. Water ingress was apparent and in danger of affecting the building structure. Epoxy resin was to repair cracks through the concrete structure (2mm or more in width) and the appropriate Dulux Weathershield system filler used on smaller cracks to these elements. Major cracks through brickwork were also repaired using resin injection. Bricks with damaged faces were repaired using mortar coloured to match original brick. Soft bricks were cut out and replaced and failed or cracked pointing was cut out and the joints re-pointed. The modern resin injection method is much less invasive system than would have been used previously and is the one that is preferred by the Conservation Officers and by 20th Century Society and English Heritage. There have been considerable problems with the balconies on the 5th floor, parts of the 4th floor and some of the lower balconies where they are exposed directly to the elements and without the sheltering effect from balconies above. Some of the balconies on the 5th floor are not just balconies but also form part of the roof over the 4th floor, so any cracks at this level or on any other exposed areas have caused serious water ingress problems. The old asphalt on these balconies as well as the minimal amount of insulation were saturated and have been stripped. Two coats of asphalt have been laid directly onto the concrete followed by a 50mm ‘Styrofoam’ insulation; on top of which 32mm thick slabs have been placed on plastic support pads (to allow rainwater to drain to drainage outlets) and finally washed gravel at the balcony floor edge. All these can be lifted to allow maintenance if and when necessary. Also, the weathering round the edges of the balcony has been improved and is lead flashed. This means that now where the asphalt is dressed into brickwork it can cope with differential movement. There was no need to re-asphalt other unexposed balconies at this time. Dulux Weathershield System with a life expectancy of 8 to 13 years has been used to re-decorate the concrete areas. All front doors and stairwell doors have been re-painted and a small number of rotted or damaged doors replaced. Bearing in mind that the majority of doors are 80 years old, a good deal of preparation was required to improve the cosmetic look. Four colours have been used (blue, green, black and red) and door frames painted white; the walkway/stairwell doors have been painted green and door frames white. There is also a move, but not through Capex works, to replace the ironmongery to as close a pattern as the original door furniture. By this means it is hoped to restore as far as possible the original look of the building. The cost of the Capex 3 project was £2.1m and spread over a period until 2017. We again utilised the services of our Construction Management team to control all of the trades utilised in this project. The original estimated time for completion of this project was 11 months from April 2014, it was however completed in …months. The cost was well controlled. A maintenance cycle programme is being prepared for the future to be fully implemented once Capex 3 is completed, the idea being that we never again let Lichfield Court get into the state it was in 2008, when the renovations started.